This is kind of a stripped down version of Read It Later or Instapaper, but functions perfectly for my workflow. 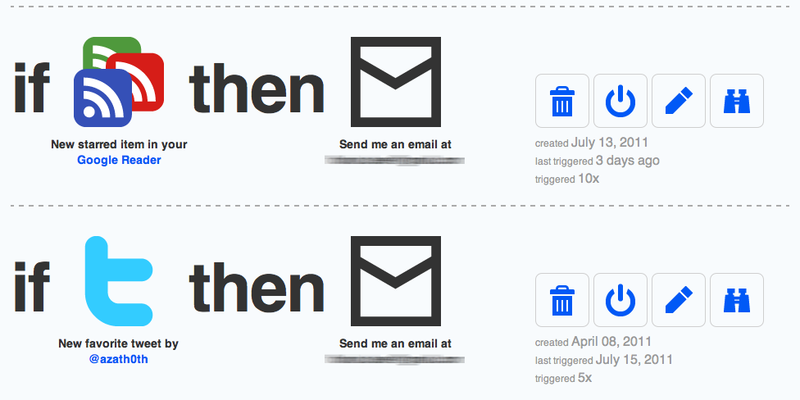 First I’ve set up actions in ifttt that forward Links I favorite in Twitter or Google Reader, to my personal Email and prepend the subject with “#ReadLater”. 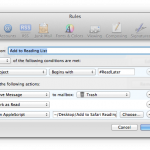 Next I constructed a Mail Rule that acts on all messages who’s subjects begin with said keyword. 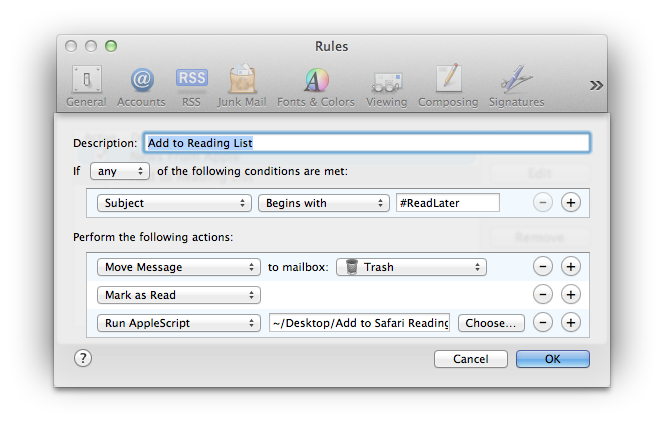 The Mail Rule will invoke the following Applescript, mark the message as read and move it to the trash. Read newsfeeds on iPhone. Save longer or interesting articles for later by clicking the favorite star. Interesting item pops up on twitter, but you don’t have time now to read the containing link right now. While walking in the street you see a URL you want to remember, just mail it to yourself with the appropriate keyword in the subject. With the introduction of Apple’s newest operating system OS X 10.7 Lion, the company has taken one step further to disconnect their users from other competing user interaction schemes. Let me elaborate on this rather strong statement by going back in history a bit. I can still remember, when I got my first Mac, it was a 12″ iBook G4 with OS X Panther. Being a rather curious person, I started tweaking the user interface and tested out all available options, until I was satisfied with the speed and metaphors of my personal set up. On thing that I started using very frequently almost immediately was Exposé (now extinct due to Lion’s Mission Control). I had several hot corners set up, so windows would fly out of the way and reveal the Desktop whenever I moved my mouse in the lower left corner of the screen or reveal all opened windows when I moved to the lower right corner. This method of interacting with my programs quickly became very natural to me. Going so far, that I started moving my mouse into corners on Windows systems several times in vain, until I realized that I had to use the taskbar for those similar tasks. This wasn’t more than a little annoyance to me. I just found out that OS X permitted me to work faster than what I’d be able to achieve in the rare cases, where I’d need to use another system. But the problem also ran in the other direction. People not used to Mac systems and their concept of hot corners seemed to have a much more clumsy way of moving their mouse around on the screen. Thus they inadvertently triggered the “Show Desktop” or “Show all windows” functions all of the time and were completely irritated by windows flying around all of the sudden. I merely laughed about that fact back then, but from my point of view today, that’s where the gap began to widen. I was used to a UI paradigm, that wasn’t logical at all for users not familiar with OS X. Skip a few years forward and now we’ve got OS X 10.7 Lion with many more ways of interaction, that are nowhere near to be seen on any other platform. Take gestures for instance: they save a lot of time and clicks when used properly, but setting ones muscle memory further apart from the rest of computer users, who don’t have or use gestures. Now this isn’t a very big problem, because gestures need special hardware to be applicable and add new ways of interaction that don’t overrule the way of using a computer you got used to before. 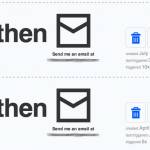 A much bigger problem could be the way Apple changed the scrolling direction in Lion. They call it “natural scrolling” and if you think about it, it makes a lot of sense and there isn’t much of a learning curve, once you’ve wrapped your head around it. But think of the ramifications that arise when others happen to sit in front of your computer or if you want to use another persons system. If I think about a typical day at work, there are several times when a colleague might sit down at my Mac to look something up, load some spreadsheet or notes about what we are just discussing, or similar examples. In the past this was no big deal, they might only be annoyed by triggering hot-corners or when they searched for the “close window” button on the wrong side of a window’s title bar. But now there is also the reversal of scrolling, which not only is new and “weird” to them, but is completely contradictory to how the same metaphor worked for them over the last decades. Don’t be mistaken, I’m not against the new “natural scrolling”. I’m getting used to it rather quickly and enjoy how I can now interact with content more logically. But on the other hand it will make it more difficult for me, whenever I have to use a Windows or Linux Desktop and now even when I use an older OS X system. At the same time other users will find it more irritating and difficult to use my machine. It will be interesting where this will take us in the future. Will the gap grow even more? Or will operating system manufacturers decide on a common ground for user interactions?